The prototypes of the new Sports Activity Vehicle are being tested on the most varied terrain and in all the world’s climate zones. Munich. One day the new BMW X5 is being tested at the polar circle and the next it is already doing laps on the Nürburgring: The driving trials for the successor of the current BMW X5 test both the car’s endurance as well as its versatility. The new Sports Activity Vehicle (SAV) is undergoing an exceptionally demanding and varied testing program as part of its series development process. The prototypes of the new BMW X5 must not only stand the test in all the world’s climate zones, but also master every kind of terrain. Here the completely new suspension technology must prove its qualities. As the first all-wheel vehicle to thrill drivers with the brand’s typical driving pleasure on winding country roads and long stretches of motorway, the first-generation BMW X5 laid the foundation for the completely new Sports Activity Vehicle category nearly two decades ago. In the coming fourth model generation, the car’s allround talents are brought to the fore as prominently as never before. This is achieved by the introduction of new suspension and chassis systems, which are available for the first time in a BMW X model and are virtually unique within the competitive field. The new offroad package for example offers an impressive combination of highest-level ride comfort on the road and the possibility of changing the vehicle setup at the press of a button to suit the conditions of driving off the beaten track perfectly. Be it snow, sand, rocks or gravel roads – the new BMW X5 has the perfect powertrain and suspension setup for each surface. The prototypes proved how capably the new BMW X5 accelerates, steers and brakes in the winter test centre in Arjeplog, Sweden, on South African gravel tracks and the in desert dune landscapes of the USA. They were subjected both to maximum cold and scorching heat. 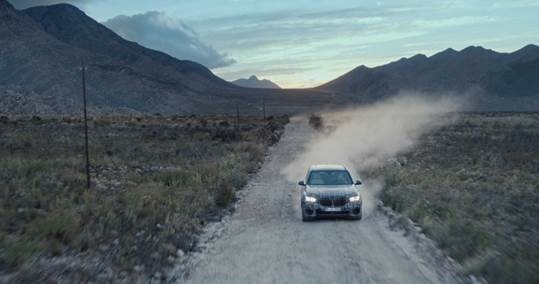 Extremely dry mountain terrain as well as tropical humidity and muddy tracks had to be mastered by the new BMW X5. And since this endurance testing only proves part of the car’s unmistakable character, the testing series conducted on the BMW Group’s testing grounds in Miramas in the South of France, on the high-speed circuit in Talladega in the US state of Alabama and on the Nürburgring racetrack in Germany were equally important. The information and insights gained here show that the new BMW X5 meets the very highest demands with regard to agility, precision, control and comfort, especially thanks to the Adaptive M Suspension Professional and the Integral Active Steering, which is also being offered for the first time.